Previous studies have validated that baseline visual acuity (VA) can predict a variance response to anti-vascular endothelial growth factor (VEGF) treatment. However, little is known about the initial systemic presentation of diabetic macular edema (DME) in clinical practice. The aim of this study is to report the baseline systemic findings of patients presenting with DME who received anti-VEGF in clinical practice. A retrospective chart review of patients with DME presenting between April 2012 and December 2016 was performed. Data from 638 patients were retrieved. The average patient age was 63.1 years (±11.6 years), and 53% were male. 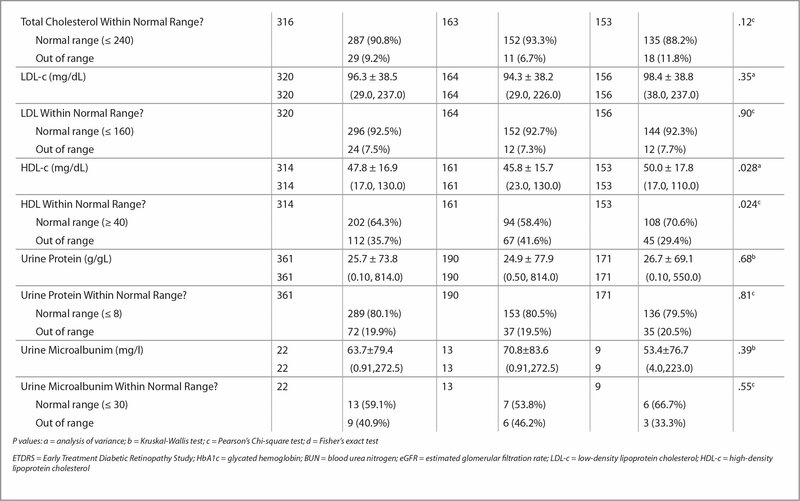 There were 95.6% type II diabetics with an average HgA1c of 8.1% (range: 5.1% to 14.5%). Insulin use was present in 67%, biguanides in 43%, sulfonylureas in 32.8%, DDP4 inhibitors in 11.8%, thiazolidinediones in 3.9%, and D-phenylalanine derivatives in 0.94%. Hypertension was present in 78.4% of patients, cardiac comorbidities in 29.3%, peripheral vascular disease in 16.5%, and renal insufficiency in 22.6%. Patients were then split into two different cohorts based on VA (ETDRS < 70 and ETDRS ≥ 70), and variables were compared between groups. It was shown that older age, hypertension, elevated creatinine, elevated high-density lipoprotein cholesterol, and decreased biguanide use were positively associated with worse presenting VA. Routine clinical practice does not always replicate the findings found in clinical research trials, as these studies enroll patients with strict inclusion and exclusion criteria that do not mimic the breadth of patients seen in routine clinical practice. A comparison between a few baseline systemic characteristics reported in recent DME trials and routine clinical practice is shown in Table 1. However, little is known about the initial presentation of DME in routine clinical practice with regard to patient systemic and ocular comorbidities, their presenting clinical findings, and initial anatomic and visual data. The most recently referenced paper from a Protocol T editorial references data for presenting VA in patients with DME from 1995 and shows that the majority of patients (more than 70%) had 20/40 or better acuity at presentation.6 Many of the DME trials included patients with 20/32 or worse VA; hence, updated information on presenting baseline characteristic information for patients with DME from routine clinical practice is lacking. The purpose of this study is to report the systemic characteristics of patients presenting with DME at the time of initiation of treatment with intravitreal anti-VEGF in routine clinical practice. The systemic variables were also compared when stratifying patients into two VA cohorts (ETDRS <70 [20/50 or worse] and ETDRS ≥70 [20/40 or better]). This study was performed at Cole Eye Institute, Cleveland, Ohio, after receiving approval from the Cleveland Clinic Investigational Review Board. All study related procedures were performed in accordance with good clinical practice (International Conference on Harmonization of Technical Requirements of Pharmaceuticals for Human Use [ICH] E6), applicable U.S. Food and Drug Administration regulations, and the Health Insurance Portability and Accountability Act. A retrospective chart review was performed to identify patients who were anti-VEGF treatment-naïve and diagnosed with DME at a single institution from April 2012 to December 2016. Patients ages 18 years and older were included if they presented with Type 1 or 2 diabetes, defined by current or historical use of insulin or oral hypoglycemic, or a documented HbA1C greater than 6.5% at the time of diagnosis. Inclusion required foveal-involving retinal edema secondary to DME as documented by clinical exam and OCT, and initiation of treatment for DME with intravitreal anti-VEGF therapy based on investigator discretion as documented in medical record. Exclusion criteria included any history of macular edema not related to diabetes, including pathologic myopia (spherical equivalent of −6 diopters or more negative, or axial length of 25 mm or more), ocular histoplasmosis syndrome, angioid streaks, choroidal rupture, choroidal neovascularization, macular edema following retinal vein occlusion, age-related macular degeneration, polypoidal choroidal vasculopathy, and any history of intraocular surgery within 3 months of encounter. Epiretinal membranes were not considered an exclusion criterion. Only one eye per subject was enrolled in the study. For patients who met eligibility criteria in both eyes, one was randomly chosen. Study variables collected from the medical records included best-corrected VA (BCVA); demographics such as age, gender, and race; type and duration of diabetes; medications; history of systemic conditions; systolic / diastolic blood pressure and relevant lab values, when available, including glycated hemoglobin (HbA1c), creatinine, blood urea nitrogen (BUN), estimated glomerular filtration rate (eGFR), cholesterol levels (total, low-density lipoprotein [LDL-C], high-density lipoprotein [HDL-C], triglycerides), urine protein and urine microalbumin within 3 months of initiation of anti-VEGF treatment. Categorical variables were described using frequencies and percentages, whereas continuous variables were described using means and standard deviations, medians and quartiles, and/or ranges. Relationships between categorical variables and ETDRS groups were assessed using Pearson Chi-square tests, Fisher's exact tests or Kruskal-Wallis tests (for ordered variables), while relationships between continuous variables and ETDRS group were assessed using analysis of variance, t-tests (for normally distributed variables), or Kruskal-Wallis tests (for non-normally distributed variables). Analyses were performed using SAS software (version 9.4; Cary, NC). Patients were split into two different cohorts based on presenting VA of ETDRS less than 70 (20/50 or worse; n = 326) and ETDRS 70 or greater (20/40 or better; n = 312) like in Protocol T, and variables were compared between groups. The average age of patients with DME requiring anti-VEGF treatment in the overall cohort was 63.1 years ± 11.6 years. Patients in the ETDRS less than 70 cohort were older, with an average age of 64.2 years ± 12.1 years versus those in the ETDRS greater than 70 cohort, who had an average age of 61.9 years ± 11.0 years (P = .016). In the overall cohort, 53% of patients were male; in the ETDRS less than 70 cohort, 53.7% were male, and in the ETDRS greater than 70 cohort, 52.2% were male (P = .72). In the overall cohort, Caucasians made up 60.7% of the group, African-Americans comprised 30.7% of the group, and Asians comprised 0.78% of the group. Ethnic groups of lower population expression in this study (Latinos, Indians, etc.) were grouped as “other,” which represented 7.8% of patients. In the ETDRS less than 70 cohort, Caucasians made up 58.9% of the group, African-American made up 31.6%, and Asians made up 0.31%, with 9.2% patients identified as “other.” In the ETDRS greater than 70 cohort, Caucasians made up 62.5% of the group, African-American made up 29.8%, and Asians made up 1.3%, with 6.4% patients identified as “other.” No statistically significant differences were found between cohorts in gender or race distributions. 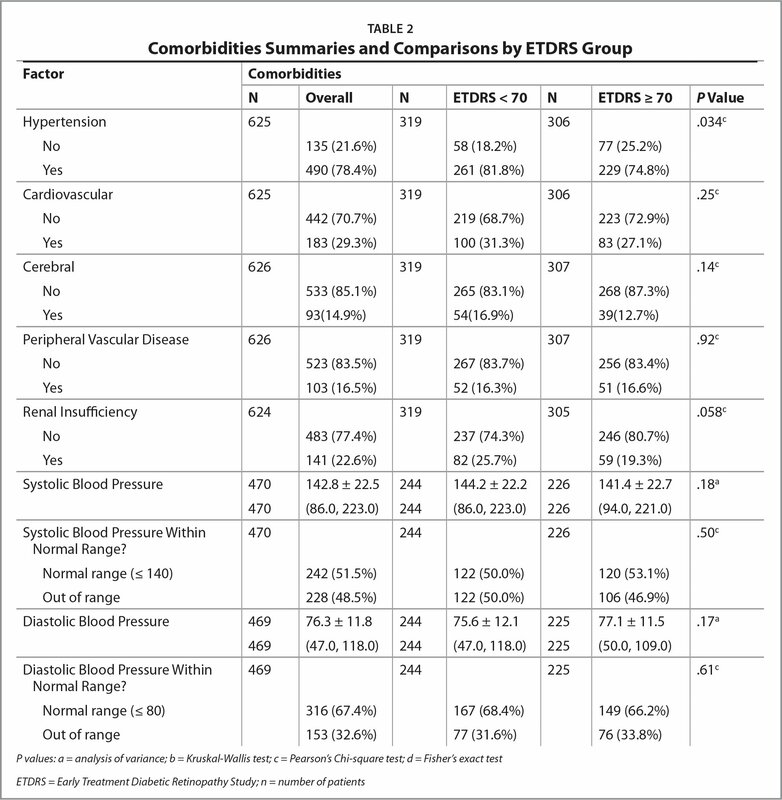 When evaluating patients for history of systemic comorbidities (Table 2), 78.4% of patients had history of hypertension (ETDRS < 70 = 81.8% vs. ETDRS >70 = 74.8%), and 29.3% had history of cardiac comorbidities (ETDRS < 70 = 31.3% vs. ETDRS > 70 = 27.1%). History of peripheral vascular disease was noted in 16.5% of patients (ETDRS < 70 = 16.3% vs. ETDRS > 70 = 16.6%), and 22.6% had history of renal insufficiency (ETDRS < 70 = 25.7% vs. ETDRS >70 = 19.3%). Within all systemic comorbidities, only history of hypertension between VA groups was significantly different (P = .034). However, there was a trend of significance in history of renal insufficiency (P = .058). Patients were diagnosed with diabetes for an average of 177.5 months ± 107.6 months (ETDRS < 70 = 179.8 ± 112 vs. ETDRS > 70 = 175.1 ± 103; P = .62) at the time of diagnosis of DME. More than 95% of the population consisted of type II diabetics (ETDRS < 70 = 95.7% vs. ETDRS >70 = 95.5%; P = .91). 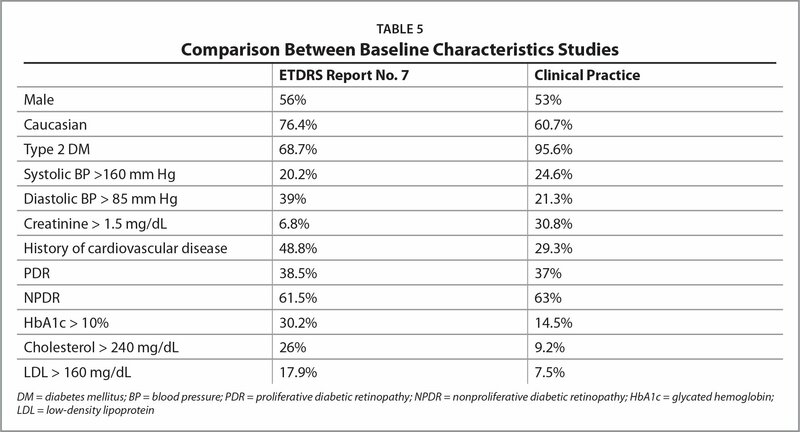 When evaluating which medications were used for treatment of diabetes (Table 3), 67% of patients were using insulin (ETDRS < 70 = 67.8% vs. ETDRS > 70 = 67%), 43% were using biguanides (ETDRS < 70 = 37.7% vs. ETDRS > 70 = 48.7%), 32.8% were using sulfonylureas (ETDRS < 70 = 30.7% vs. ETDRS > 70 = 34.9%), 11.8% were using DDP4 inhibitors (ETDRS < 70 = 0.61% vs. ETDRS > 70 = 1.3%), 3.9% were using thiazolidinediones (ETDRS < 70 = 3.7% vs. ETDRS > 70 = 4.2%), 11.8% were using D-phenylalanine derivatives (ETDRS < 70 = 12.6% vs. ETDRS > 70 = 10.9%), and 0.31% were using bile acid sequestrants (ETDRS < 70 = 0.31% vs. ETDRS > 70 = 0.32%), with 5% reporting being controlled by diet alone (ETDRS < 70 = 3.1% vs. ETDRS > 70 = 6.3%). No patients reported using alpha glucosidade inhibitors. Only the use of biguanides was found to be significantly different between groups (P = .005). The number of patients using metiglinides in the whole cohort was too low (n = 5) for the statistical assessment to be relevant. The average HgA1c in the whole cohort was found to be 8.1% ± 1.8% (ETDRS < 70 = 8.1% ± 1.8% vs. ETDRS >70 = 8% ± 1.9%). Renal function labs included an average creatinine of 1.6 mg/dL ± 1.4 mg/dL (ETDRS < 70 = 1.7 mg/dL ± 1.6 mg/dL vs. ETDRS > 70 = 1.4 mg/dL ± 1 mg/dL); BUN of 26.7 mg/dL ± 16.6 mg/dL (ETDRS < 70 = 27.9 mg/dL ± 17.2 mg/dL vs. ETDRS > 70 = 25.5 mg/dL ± 15.7 mg/dL); eGFR of 41.6 mL/min/1.73m2 ± 15.9 mL/min/1.73m2 (ETDRS < 70 = 40.5 mL/min/1.73m2 ± 16.9 mL/min/1.73m2 vs. ETDRS > 70 = 42.9 mL/min/1.73m2 ± 14.7 mL/min/1.73m2); and urine microalbumin of 63.7 mcg/L ± 79.4 mcg/L (ETDRS < 70 = 70.8 mcg/L ± 83.6 mcg/L vs. ETDRS > 70 = 53.4 mcg/L ± 76.7 mcg/L). Lipid values were as follows: triglycerides of 140 mg/dL ± mg/dL 93.9 mg/dL in the whole cohort (ETDRS < 70 = 137.2 mg/dL ± 88.3 mg/dL vs. ETDRS > 70 = 142.9 mg/dL ± 98.5 mg/dL); total cholesterol of 171.3 mg/dL ± 46.6 mg/dL (ETDRS < 70 = 167.3 mg/dL ± 46.8 mg/dL vs. ETDRS > 70 = 175.5 mg/dL ± 46.1 mg/dL), LDL-C of 96.3 mg/dL ± 38.5 mg/dL (ETDRS < 70 = 94.3 ± 38.2 mg/dL vs. ETDRS > 70 = 98.4 mg/dL ± 38.8 mg/dL); and HDL-C of 47.8 mg/dL ± 16.9 mg/dL (ETDRS < 70 = 45.8 mg/dL ± 15.7 mg/dL vs. ETDRS > 70 = 50 mg/dL ± 17.8 mg/dL). Creatinine (P = .047), and HDL-C levels (P = .028) were the only metabolic indicators significantly different between the two VA groups; however, there was clearly a trend in BUN levels (P = .056). 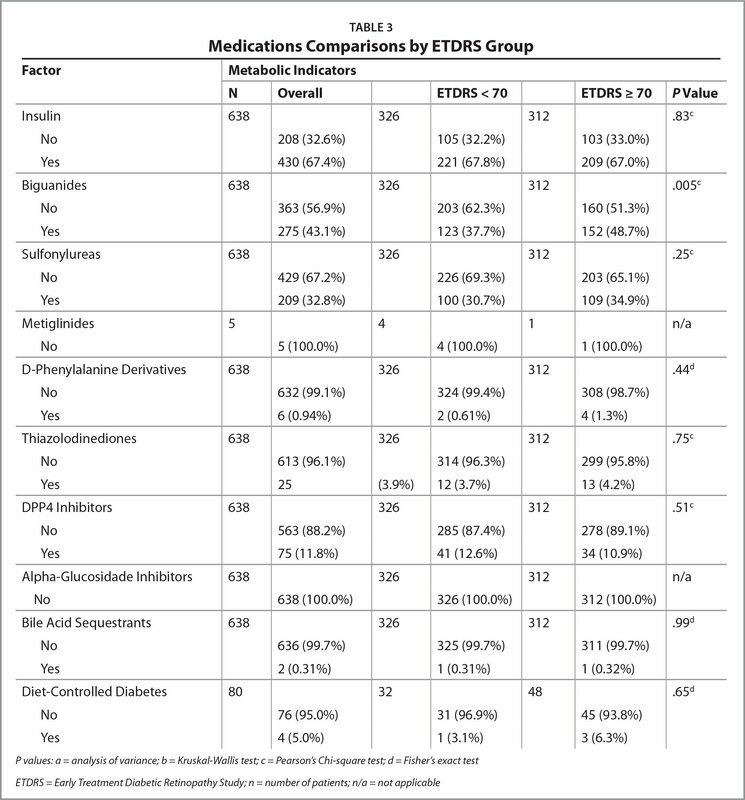 All metabolic indicators and comparisons by ETDRS BCVA groups can be seen in Table 4. Intravitreal drug chosen for DME management initiation was also recorded. In the overall cohort, 605 patients (94.8%) initiated treatment with bevacizumab, 11 (1.7%) with ranibizumab, 19 (3%) with aflibercept, and one (0.1%) with steroids. In the ETDRS less than 70 group, bevacizumab was used in 305 patients (93.6%), ranibizumab in five (1.5%), aflibercept in 14 (4.3%), and steroids in one (0.3%). Moreover, in the ETDRS 70 or greater group, 300 patients (96.2%) used bevacizumab, six (1.9%) used ranibizumab, and five (1.6%) used aflibercept; no patient was treated with steroids. There was a significant difference in the hypertensive population between visual acuity groups, with the ETDRS less than 70 group having a higher number of patients reporting a diagnosis of hypertension. Elevated blood pressure is a well-known cause of retinal pathology and a risk factor for DME, associated with clinical signs such as generalized and focal arteriolar narrowing, arteriovenous nicking, flame-shaped and blot-shaped retinal hemorrhages, cotton-wool spots, and swelling of the optic disc. The vascular changes stem from intimal thickening, hyperplasia of the media wall, hyaline degeneration, and later, breakdown of the blood-retinal barrier brought about by persistent hypertension.13 The neural changes stem from obstruction of axoplasmic transport on the periphery of areas infarcted by vascular damage (in the case of cotton-wool spots) and increased intracranial pressure in malignant hypertension (in the case of optic disc swelling).14 Hypertension may cause damage to retinal vessels independently of, and in addition to, hyperglycemia. Thus, patients with hypertension would be likely to have worse VA than those with normal blood pressure. Creatinine level was, on average, higher in the ETDRS less than 70 group. Additionally, there was a trend of higher BUN levels in the same group. BUN and creatinine are catabolic products of muscle tissue that is cleared by the kidneys and are widely used as an indicator of renal function. BUN normal range is 7 mg/dL to 20 mg/dL and creatinine is 0.6 mg/dL to 1.1 mg/dL in females and 0.7 mg/dL to 1.3 mg/dL in male patients. Factors such as age, weight, and race may influence values. Renal disease is a common complication of diabetes, and although our study did not find significant differences in HgA1c between the two VA groups, HbA1c may be altered by any condition that shortens erythrocyte lifespan (eg, blood loss, hemolytic anemia) and by renal disease itself.15 In such cases, it may be an unreliable indicator of glycemic control. Elevated creatinine and BUN may be reflective of renal pathology brought on by poorer glycemic control not reflected in HgA1c levels, which would cause retinal damage through the mechanisms described above. 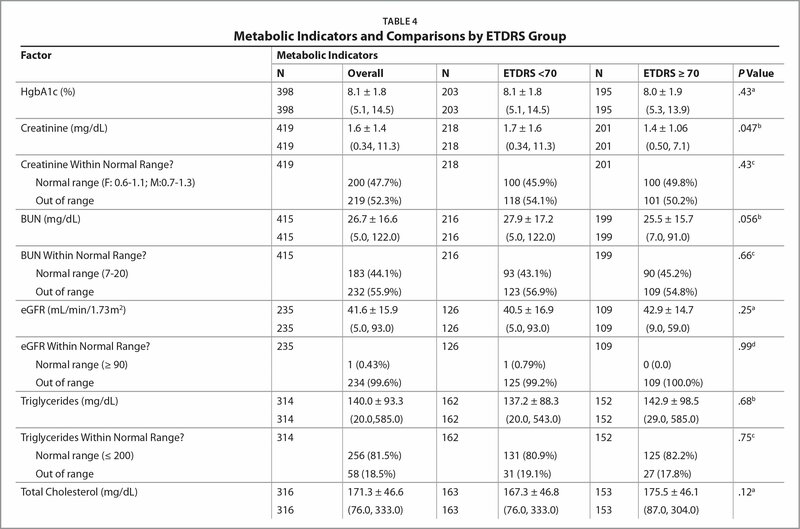 Patients in the ETDRS less than 70 group had higher HDL levels, on average. Previous studies have generally not found a significant association between HDL levels and retinopathy.16–18 The probability of this result being merely due to chance exists. Therefore, further investigation is required to study the correlation between cholesterol levels and VA in patients with DME. Patients in the ETDRS less than 70 group were on average less likely to use biguanides. The most common biguanide used today is metformin, which improves sensitivity to insulin and strengthens insulin's stimulation of the utilization of glucose. Metformin has been shown to be protective to renal tubular cells by reducing oxidative stress and restoring physiological biochemical pathways.19 In addition, animal models in diabetic nephropathy have demonstrated metformin has a protective effect on renal podocyte injury.20 Similar models have demonstrated metformin has a protective effect against retinal cell death in diabetic retinas compared to control retinas.21 In other animal models, metformin has been shown to phosphorylate the VEGF2 receptor, which decreases VEGF signaling in retinas.22 These data support the idea that metformin may lead to healthier retinal vasculature, which may therefore be less affected by the toxic oxidative stress and capillary damage from hyperglycemia. Thus, it might be hypothesized that patients using metformin may have better VAs than those who do not use the medication. Strengths of this study include its large number of subjects with available lab data. Additionally, it has a less stringent inclusion criteria compared to randomized clinical trials, reflecting real-world analysis. The data reviewed were collected during the last few years, which presents a more recent viewpoint into patients with DME than previous, older studies. Weaknesses include the retrospective nature of the study and the limit to only one study center for patient data collection. Additionally, further reviews and studies should consider socioeconomic factors, including access to health care, type of insurance, or education level. This may contribute to worse VA on presentation, which may be related to chronicity of disease. In conclusion, this study presents data on patients presenting with DME for initiation of anti-VEGF injections in routine clinical practice. In this scenario, it was found that older age, hypertension, elevated creatinine, elevated HDL-C, and decreased biguanide use were all positively associated with worse presenting VA.
Antonetti DA, Klein R, Gardner TW. Diabetic retinopathy. N Engl J Med. 2012;43(1):13–19. Pitts DG. Visual acuity as a function of age. J Am Optom Assoc. 1982;53(2):117–124. Tien YW, McIntosh R. Hypertensive retinopathy signs as risk indicators of cardiovascular morbidity and mortality. Br Med Bull. 2005;73–74:57–70. Rafieian-Kopaei M, Ghaed-Amini F, Nasri H. Metformin and renal protection. J Isfahan Med Sch. 2014;32(307). Yi QY, Deng G, Chen N, et al. Metformin inhibits development of diabetic retinopathy through inducing alternative splicing of VEGF-A. Am J Transl Res. 2016;8(9):3947–3954. From Case Western Reserve University School of Medicine, Cleveland (SH, MH, RPS); Cole Eye Institute, Cleveland Clinic Foundation, Cleveland (WHA, TFC, FFC, FQS, RPS); and the Center for Ophthalmic Bioinformatics, Cole Eye Institute, Cleveland Clinic Foundation, Cleveland (TFC, FFC, RPS). This study was supported by a research grant from Regeneron Pharmaceuticals. Dr. Singh has received grants and personal fees from Regeneron, Genentech/Roche, and Alcon/Novartis; personal fees from Optos, Zeiss, and Biogen; and grants from Apellis during the conduct of the study. The remaining authors report no relevant financial disclosures. Address correspondence to Rishi P. Singh, MD, Cole Eye Institute, Cleveland Clinic Foundation, 9500 Euclid Ave, Mail Code i-32, Cleveland, OH 44195; email: singhr@ccf.org.